Belonging to a family of food lovers, it is his love for food that drives the restaurant to where it is today and fuels everyone in his kitchen to cater to every taste bud, sending tantalising shivers down into everyone's tummies. Paratha Mantra, owned solely by Antariksh Baldota now; leaves an aftertaste of 'I want some more'..., and may be a tiny burp too! Paratha Mantra caters to a wide Target Audience: from children to families, a bunch of friends, an old couple, a group of ladies for an evening snack and chit chat, a quick date with your loved one and several walk-ins! This is what makes the restaurant wholesome and alive, just like it's food. Wielding a perfect blend of quality and quantity, innovation is what helps this contemporary and wonderful restaurant stand out of the clutter. Amongst the many restaurants in this area, this one captivates all kinds of crowd, due to its economical price point and homely ambience! There are several reasons why Paratha Mantra is well known and liked by many too! And that made us win the award for the best Vegetarian Restaurant in Mumbai in its first year of establishment. From spicy and pungent parathas to Western; creamy, bland and tangy ones; innovation is the secret behind every delicious paratha. Perpetually innovating and adding more and more flavours makes clients come back for something more. Making Paratha Mantra a favourite amongst few celebrities and sportsmen too. Antariksh Baldota understands his market well and keeps a tab on food trends and acquired tastes while accommodating all this understanding into his food at the restaurant! The menu is delightfully long. 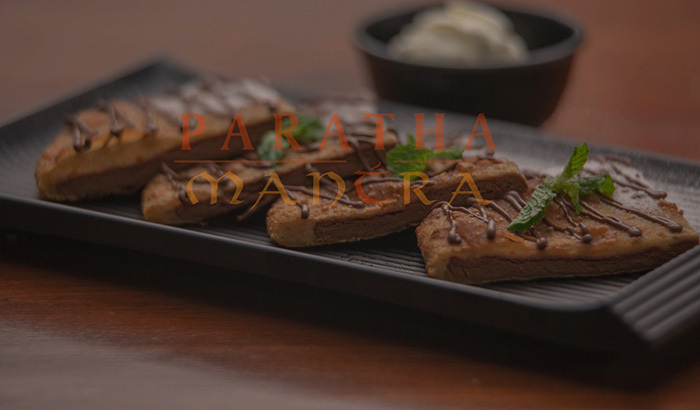 Basic Parathas like Cheese Paratha, to our favourite AAMCHI MUMBAI Special Vada Pav Paratha; to the Lebanese Zatar Cheese Paratha; to the finely designed Italian Pizza Paratha and also to end with a smile, the Chocolate Paratha. The list is endless. Paratha Mantra has a few more delectable dishes to offer! In the world of Indian Breads, Antariksh Baldota aspires to be the best amongst all. With a present this bright, future looks sunny side up for Paratha Mantra! Seemingly possible opportunities abroad and appropriate associations and possible franchises here and there!